I haven’t been sleeping that great the past few weeks, and that’s been mainly cause I’m being woken up at five in the morning by two cute yet annoying hungry creatures. Because of that though I’ve been struggling with waking up in the morning, preferring to hit snooze just once more. 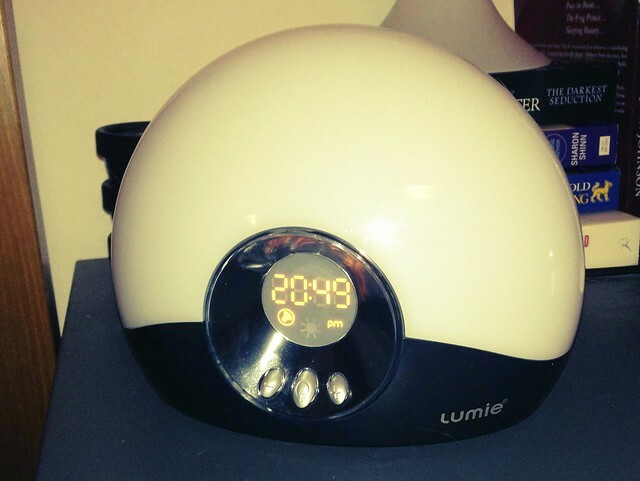 Thanks to John Lewis though, I’ve got to try out a Lumie Bodyclock Go the past week. It’s an alarm clock that wakes you up by creating a gradual sunrise. It also has a sunset setting, to allow you to fall asleep to slowly dimming light. I was a bit sceptical at first, but I think it actually sort of works for me. I’ve been using the Bodyclock the past few day with a 30 minute sunrise and the optional alarm clock sound. Now it still hasn’t managed to wake me up completely through light only; it’s only when the alarm clock sound goes, that I wake up and get out of bed. That’s the thing that surprised me though. The moment the alarm clock sound goes, I’m wide awake and ready to start my day. Somehow my body has been woken up by the half hour sunrise and I don’t feel the urge to hit the snooze button anymore. Brilliant. The one annoying thing though is that alarm clock sound. You can choose from 5 different sounds (or no sound at all), but you can’t actually set the volume of that sound. Meaning it’s stuck on this quite loud level, which feels too harsh in the morning. I had expected there to be some form of volume control, or even better a gradually increasing alarm sound to match the gradually increasing light. The Lumie Bodyclock has three buttons: the main button in the middle, and – and + buttons on the left and the right. Pressing the middle button turns the alarm clock on, holding it down gives you access to the settings. You can set the alarm clock time, the actual time, the length of the sunrise and sunset (15, 30 or 45 minutes) and the optional alarm sound (5 different sounds). Using the clock isn’t exactly straightforward: you can’t use it out of the box just like that, you need to read the manual a bit to understand the different settings. Once you do though, it’s quite easy to use. I quite like the Lumie Bodyclock Go and it does seem as if the light is helping me get up in the morning. It could do with some better sound settings though for those of us that don’t wake up through the light only. The way I’m going to use it now is without the alarm clock sound and use my iPhone next to it as a backup alarm clock system. Disclaimer: John Lewis provided the Lumie Bodyclock Go for review purposes. All opinions are my own.